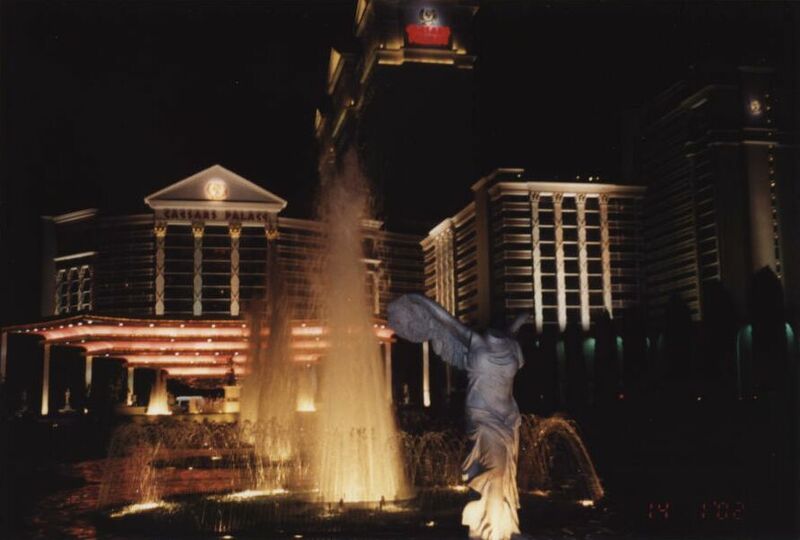 When Caesars Palace opened on August 5, 1966 (700 rooms) the Dunes was to the south (now Bellagio) and the Flamingo was across the street. 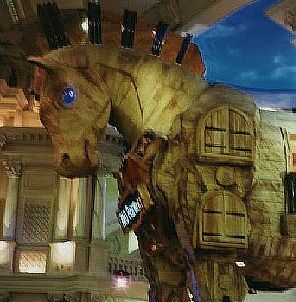 Caesars Palace is constantly undergoing changes and expansions - more shops in the Forum, new buildings, changing the facade, landscaping, etc. A replica of the Colosseum is going to replace the Circus Maximus showroom. 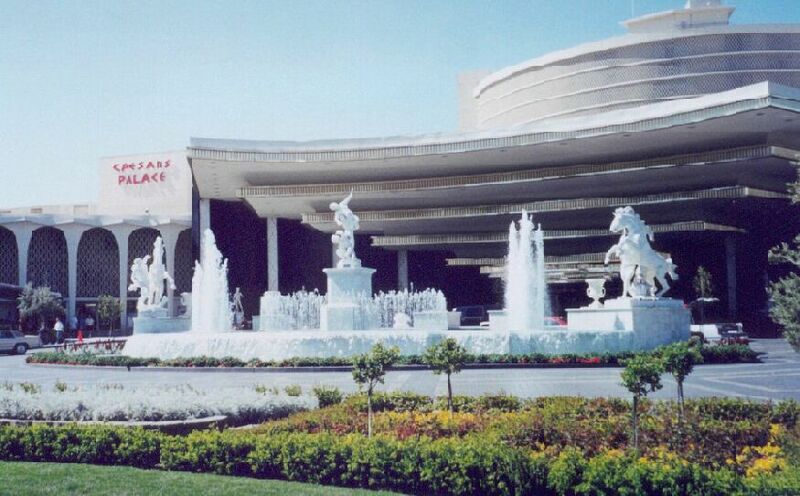 The new showroom is scheduled to open in March, 2003 with singer Celine Dion performing. 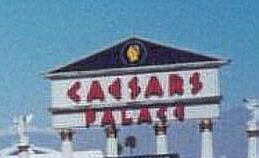 new facade, as seen from Las Vegas Blvd. 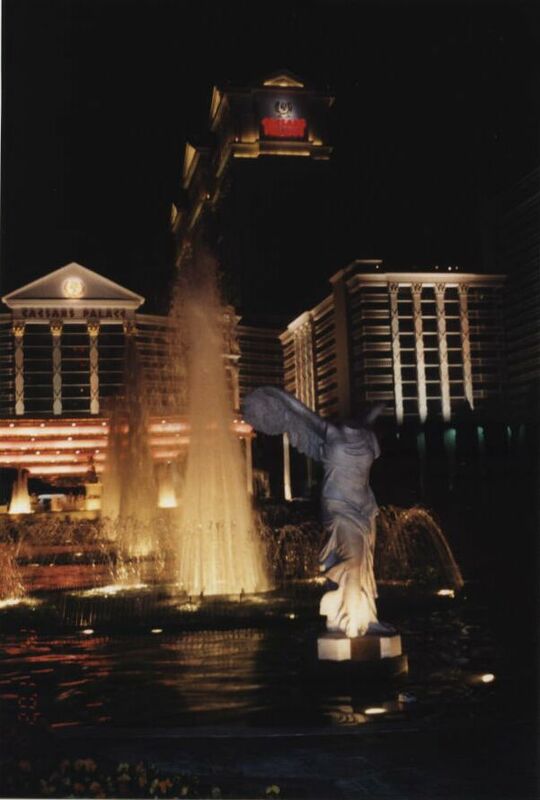 I think this is still one of the classiest places in Vegas. 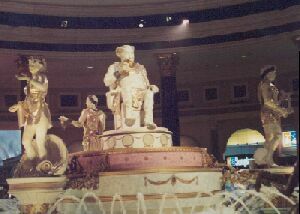 The Roman theme is found throughout the resort inside and out. 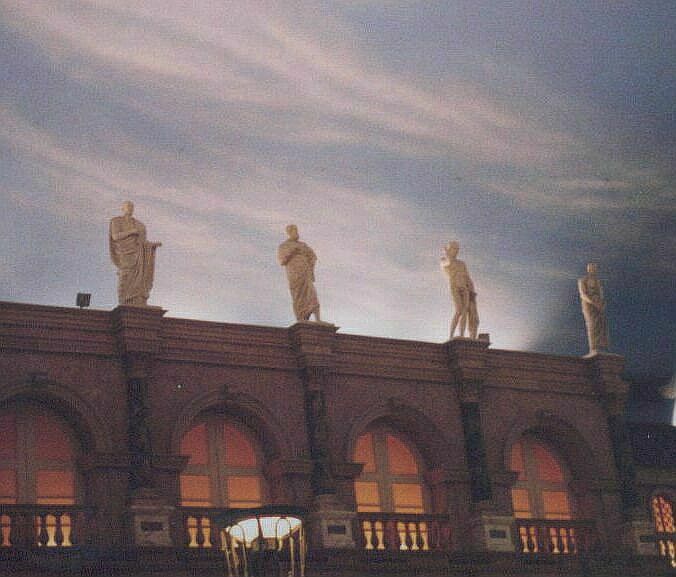 Statues greet you at the entrance. Take a walk along the Appian Way to see an exact replica of David, Michelangelo's masterpiece. The Garden of the Gods is beautifully landscaped with more statues, fountains, swimming pools and whirlpool spas. 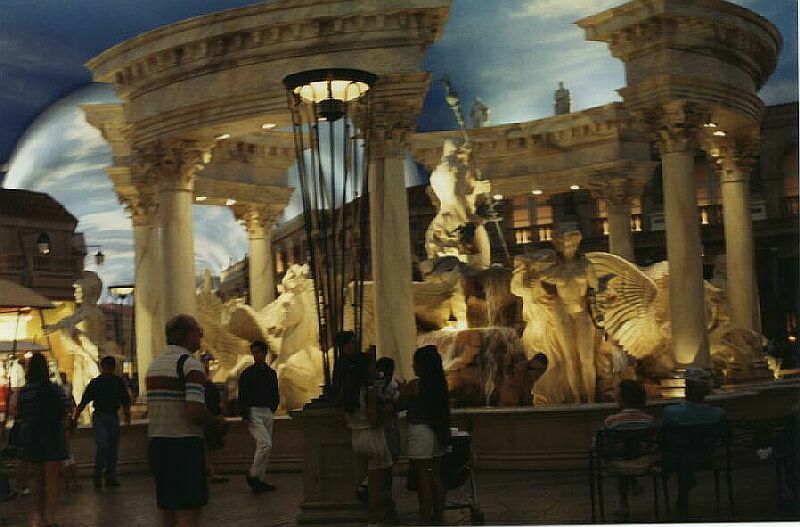 You feel like you are dining in Rome - at Nero's, Cafe Lago and La Palatium. La Piazza food court is a sidewalk cafe where you can sit under the trees and watch people as they go by, except that you are indoors. Moving walkways take you from the street to the casino. 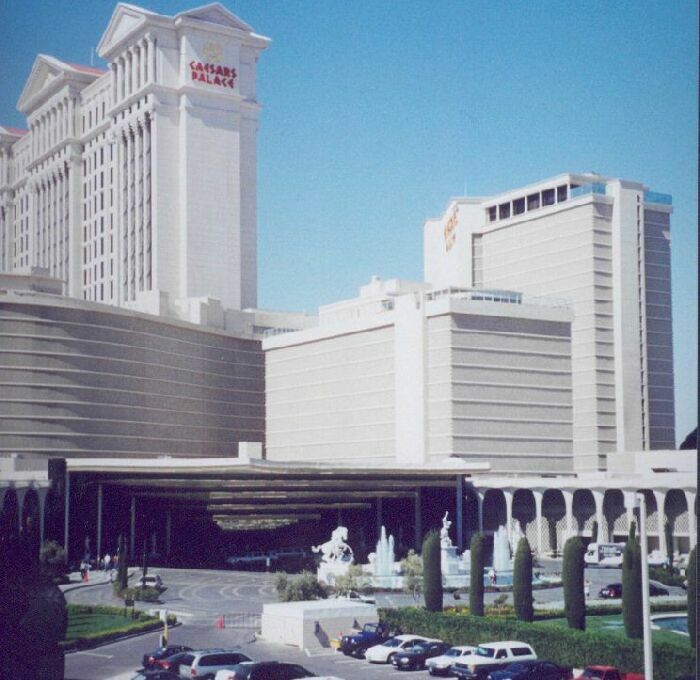 I have difficulty getting around in this huge casino without getting lost. 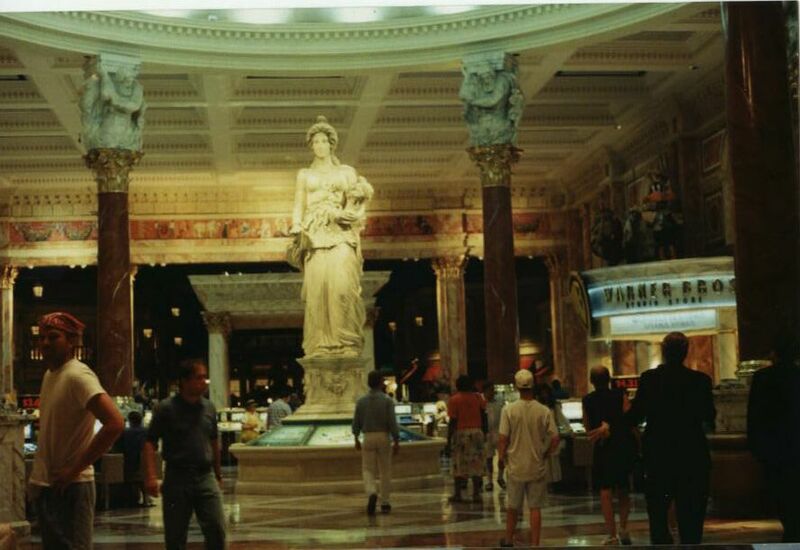 A visit to the Forum Shops is like being in ancient Rome. 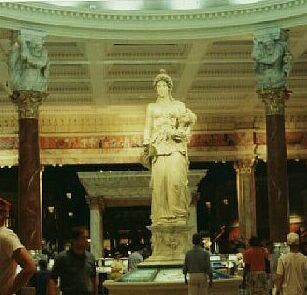 The columns, arches and storefront facades make this a unique shopping mall. 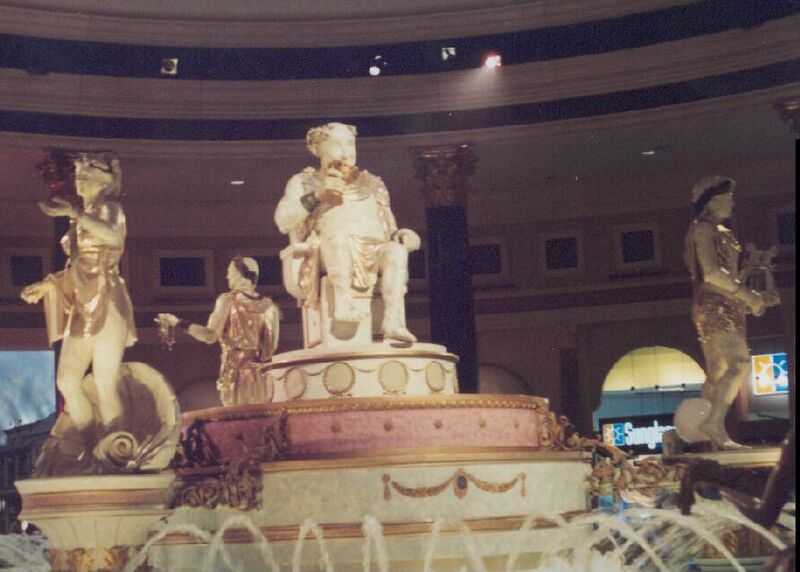 Relax by the fountains and admire the statues. 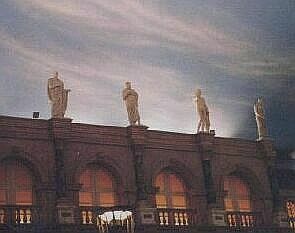 ( fountain view 1, view 2 ) The sky constantly changes from day to night. 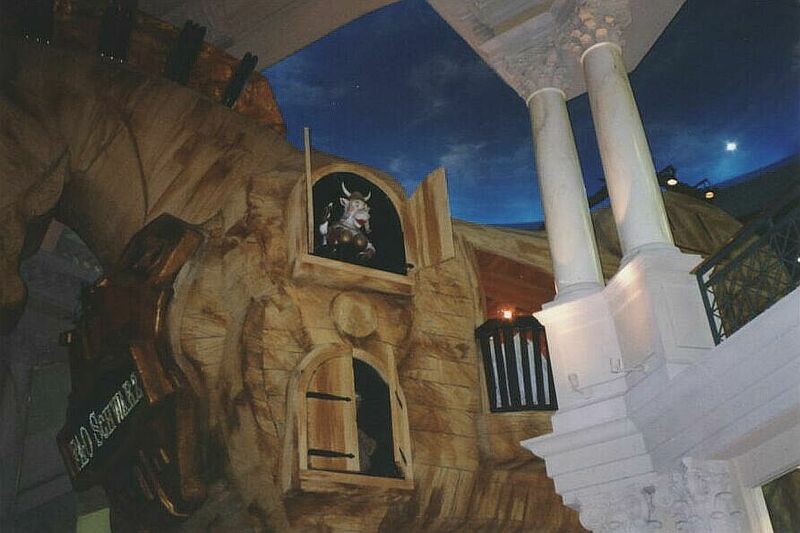 At the Roman Great Hall there is a 50,000 gallon aquarium where the Atlantis show takes place. They claim to have more than 500 tropical fish (including flounders, rays, puffers and sharks) in the aquarium. 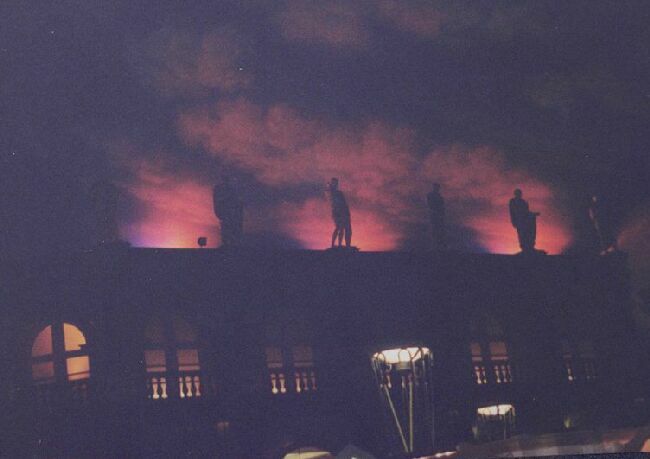 The Story of Atlantis show incorporates many special effects. 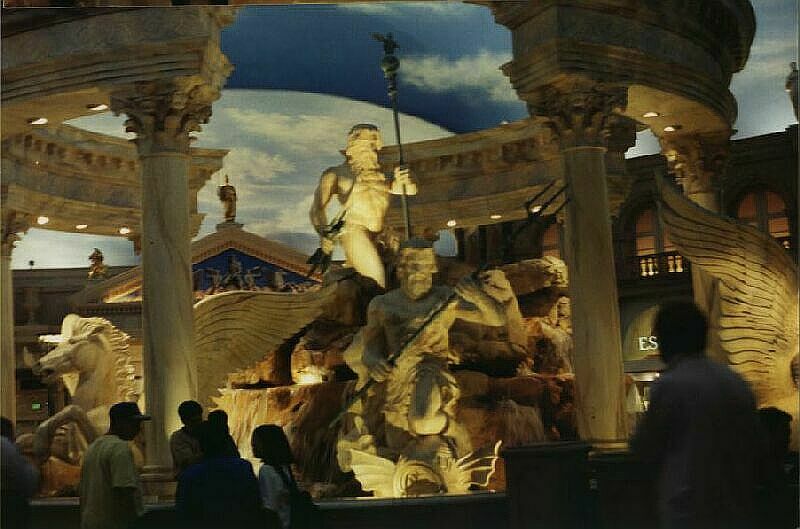 Lasers, sprays of water and smoke recreate a battle as the two children of Neptune fight over control of Atlantis. 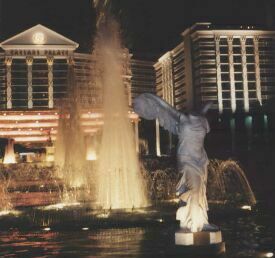 Every hour at the Fountain of the Gods, Bacchus, Venus, Apollo and Plutus are featured in an animated robotic sound and light show. If you have time to visit only one shop, go to FAO Schwartz (world famous toy store). 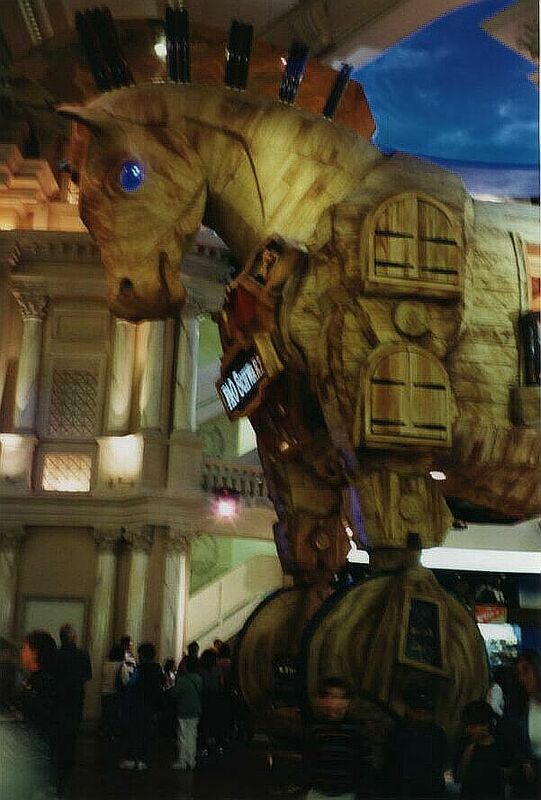 You can't miss the enormous Trojan Horse at the entrance to the multi-levelled store. 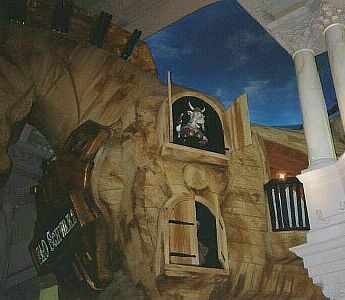 In the store window there is a large display called Playgroundus Maximus. It consists of many cute animated stuffed animals. Inside the store are stuffed animals of all shapes and sizes. There are departments featuring Star Wars and space toys, Lego kits, Barbies, etc. Whatever toys, kits or games you may be looking for you will probably find in this store. I also enjoy browsing at all the interesting merchandise at the Endangered Species Store. Browsing is about all I do at the Forum Shops. Most of the stores and restaurants are expensive. Yes, it's just like being in Rome.